there are several farmers markets in and around Hilo on the Big Island. The Hilo farmers market is by far the largest and most popular one, but each one of the smaller ones is certainly worth a stop if you happen to pass by on a market day. For all markets on the Big Island see our list of farmers markets in Hawai’i. 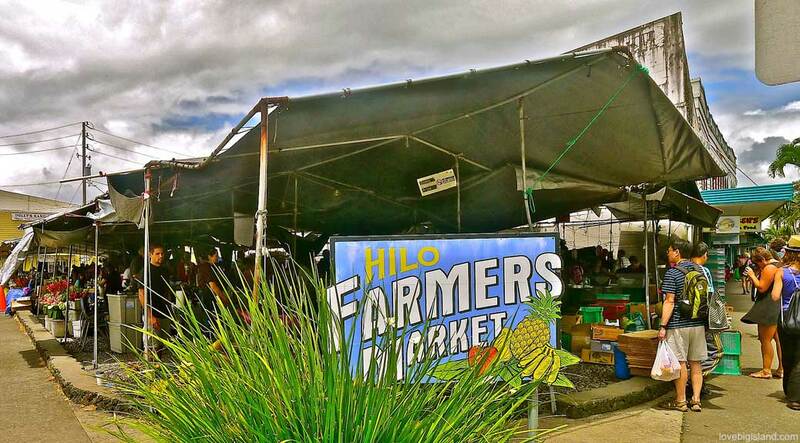 The Hilo Farmers Market is a must-visit if you are in Hilo on a Wednesday or Saturday. Over 200 local farmers and crafters sell their produce, crafts, gift items and tropical flowers in a festive outdoor atmosphere that recalls back to the old “plantation” days of early Hilo. Market day at the Farmers Market in Hilo, Hawaii. This market is a favorite of both locals and visitors, and a great place to pick up gifts and souvenirs for your loved ones back home! The Hilo farmers market is located at the corner of Mamo Street and Kamehameha Avenue in historic downtown Hilo in front of Hilo bay. Big market days are Wednesday and Saturday between 6 a.m. and 4 p.m. The market is also open all other weekdays except Sunday between 7 a.m. and 4 p.m., but there will be less vendors. The Hilo farmers market on a market day (Wednesday and Saturday). More information on the Hilo Farmers Market website. Don’t forget about the free parking at the farmers market! 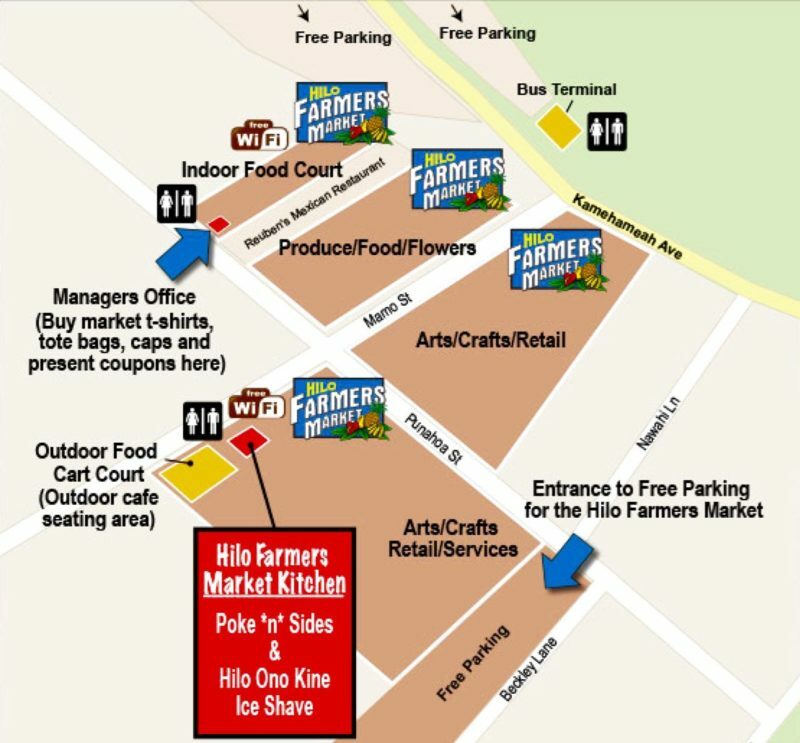 Map retrieved from Hilo Farmers Market website on 05/2017. The farmers market in Mountain View features Hawai`i grown fruits, vegetables, flowers, plants and other Hawaii-grown farm and value-added products. All vendors sell products grown on local farms or value added products using Big Island grown produce. Fresh cooked local ingredient breakfasts are prepared outside on the griddle every Saturday. Directions: Hilo Coffee Mill Farm, 17-995 Volcano Rd. (Between Mile Markers 12 and 13) in Mountain View, HI. For more information about the Market @ The Mill call Katherine Patton at +1 (808) 968-1333. 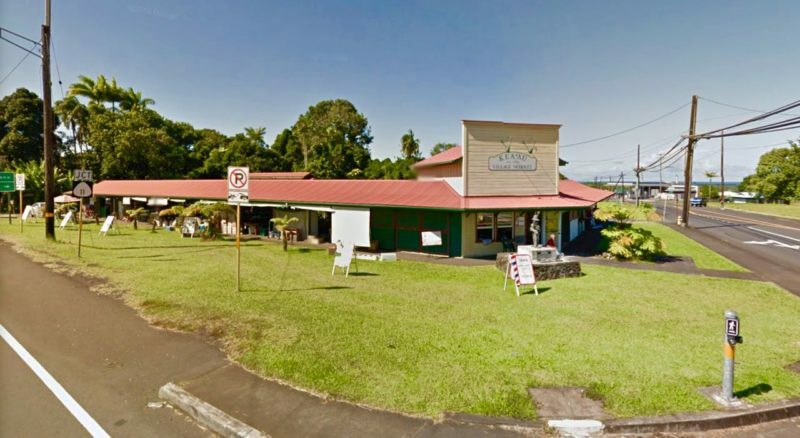 The Keaau village farmers market is a small farmers market in the village of Kea’au, 8 miles (15 minutes) south of Hilo. You can find lots of affordable produce at this market, a bakery, and several places where you can have breakfast and (take out) lunch. One big recommendation is to eat at Ma’s kitchen when you are visiting. This market has a very local feel and the prizes of the fruit and produce are lower than those at the Hilo farmers market. View of the Kea’au village market from the street. The farmers market is held on the inside courtyard of this building. Image adapted from google maps. The Maku‘u Farmers’ Market is a large market with stalls for up to 150 local merchants and artisans. You can find produce and food at the market, and a wide variety of new and recycled products including crafts, plants, jewelry, clothing, books, and records/cds. The Farmers’ Market often has live music and entertainment in addition to a small food court which make it a fun stop if you pass by on Sunday mornings. “thing to do,” the “place to be” on Sunday morning. This is a good stop if you are looking for a local (less touristy) farmers market in Hilo. The Kinoole farmers market prides itself to sell only 100% Hawaiian grown products, the best of which sell out early. The best things sell out early so make this a stop at the start of your day if you are interested in visiting. The parking lot on which the Kinoole farmers market is held every Saturday morning. Image adapted from Google maps. The Keaukaha Pana’ewa Farmers Market first opened on September 10th 2011 and is the youngest farmers market on the Big Island. They are opened Saturday mornings between 07:00 AM and 1:00 PM. You can find stalls there selling locally grown vegetables, fruits, plants, baked goods, food items, jams, jellies,fish, Hawaiian crafts, and other Agricultural products. Try to drop by if you are shopping for groceries at the shopping mall next door for a more local taste of Hawaii. 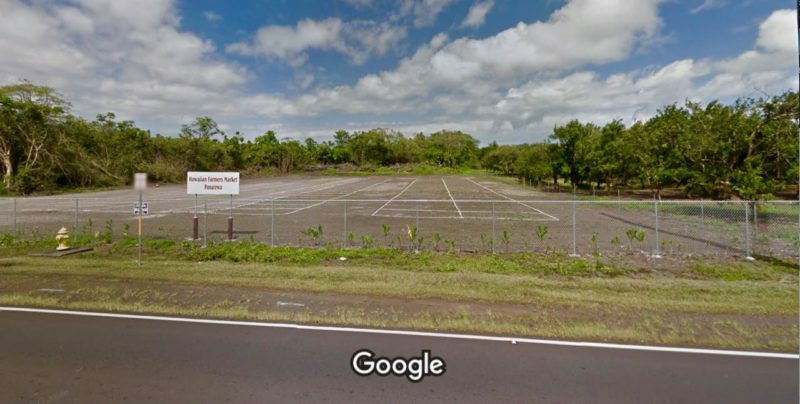 This is the plot on which the Keaukaha Pana’ewa farmers market is organized every Saturday morning. Image credit: google maps.